The main discussion in this week's show focuses ISO settings (and how far you can go with them). I also revisit the memory card fiasco from last week and touch on the new WiFi cameras offered by Nikon and Canon. Sometimes referred to as film speed, ISO speed is actually a better term for expressing the light sensitivity of your digital camera. ISO stands for International Organization for Standardization. This entity has established many standards, including the light sensitivity of photographic materials. If your camera has multiple ISO speed settings, then you can use these adjustments to increase the light sensitivity of the image sensor. The default setting for most digicams is ISO 100. 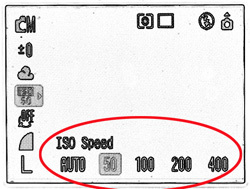 This is the speed setting for general photography. If youâ€™re in a low-light situation and need to increase the sensitivity of you image sensor, change the ISO Speed setting from 100 to 200, 400 or even 800, if necessary. Each setting is the equivalent to one f-stop of light. The general rule of thumb is to keep your ISO setting as low as possible on compact cameras (100 or 200), but understand that you have more latitude with Digital SLRs, which have larger image sensors and more robust electronics. I've had good luck with my Canon Rebel XT at ISO 400 and 800. Now that I have your curiosity piqued, it's time to listen to today's audio show titled, "ISO Settings and More" You can download the podcast here (30 minutes). I listened to your your pod cast #7 on the way to work this morning (as I have with #1 thru #7) and am responding to your request for comments on your pod casts. While the audio is better than many of the pod casts that I have listened to, I believe that, with just a couple changes that would affect sound quality, it could be more enjoyable to listen to. 1. The audio sounds as though you are recording in a very small room with a lots of reverb. If this is the case, try recording in a more open location. 2. You have a tendency to drop your voice as you are approaching the end of a sentence instead of at the very end of the sentence. The effect of this is that the last word or two in the sentence are difficult to understand. Practice dropping your voice only at the last syllable before the period. Thanks for an excellent pod cast! Thanks for your comments, Jack. This type of feedback is really helpful. As to point #1, yes, I had problems with my set up this time and even debated holding back the show to rerecord. Should be back on track with show #8. Point #2 is really interesting, though, and I hadn't noticed the dropping voice thing. I will definitely listen to the last show and make some adjustments for show #8. Just out of curiousity, how do you listen to the show? With headphones, through laptop speakers, in the car? I listen to your pod cast with a most elegant solution. I subscribe through iTunes, plug a Sony cassette adapter into my iPod, and listen through the audio system in my car. I agree with Jack. The podcasts are great. The technical production could use some work. Podcast #7 was especially problematic. What kind of equipment are you recording with? A couple suggestions are to get right up on the microphone when speaking, using a larger room like Jack suggested, or spreading blankets/pillows around the room you're in to absorb sound reflections, and using some limiting. The best bet would be to use a dedicated limiter, but the dynamics processors in GarageBand do a pretty good job as well (if that's what you're using). I hope you don't mind my suggestions, but I feel I should give something back for the enjoyable show you give me. Hey Tony, I don't mind the suggestions at all. I just ran into some difficulties with show #7. Long story short, my boom broke and sent the mic flying across the room breaking its holder. I tried to rig up something without the boom in another location, and hence all the sound bouncing around. Should have things under control for the upcoming show :) Let me know what you think after listening. As jay Maisel says, he'd "rather use ISO 800 and get the shot than use something less and miss it." When absolute quality matters, use a low ISO and a tripod if necessary. Otherwise, pump up the ISO and get the picture. I'd rather have a little grain in the picture of someone doing something special than have a picture so blurry that it is unuseable. +1 on Michael's ISO comment. If there's some image noise, I'll deal with it in post production. I'd rather have a sharp shot of something interesting rather than miss it altogether.